Mechanical waves require the presence of a medium. 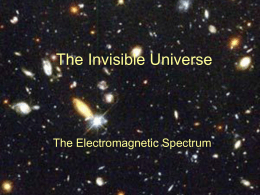 Electromagnetic waves can propagate through empty space. propagate through space at the speed of light. 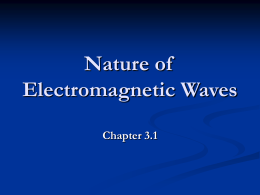 Electromagnetic waves are generated by oscillating electric charges. 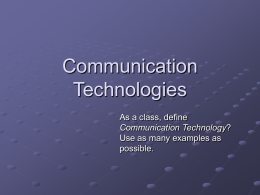 Electromagnetic waves carry energy and momentum. 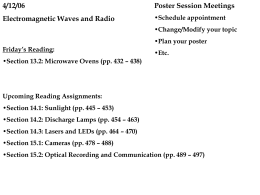 Electromagnetic waves cover many frequencies. field equations that bear his name. But, this form is valid only if any electric fields present are constant in time. 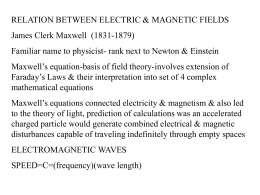 Maxwell modified the equation to include time-varying electric fields. Maxwell’s modification was to add a term. The additional term included a factor called the displacement current, Id. 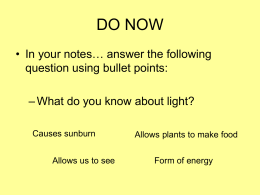 This term was then added to Ampère’s Law. This relates an electric field to the charge distribution that creates it. The net magnetic flux through a closed surface is zero. number that leave that volume. If this weren’t true, there would be magnetic monopoles found in nature. Describes the creation of an electric field by a time-varying magnetic field. One consequence is the current induced in a conducting loop placed in a timevarying magnetic field. electric flux through any surface bounded by that path. 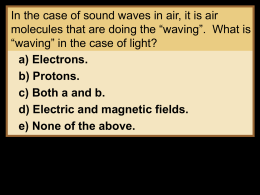 acting on a particle of charge q can be found. electromagnetic waves travel is the speed of light. equivalent to an LC circuit. frequency of the receiver was adjusted to match that of the transmitter. by this equipment exhibited wave properties. He also measured the speed of the radiation.  It was close to the known value of the speed of light. a pair of perpendicular axes are said to be linearly polarized waves. depend upon x and t only. A ray is a line along which the wave travels. The collection of waves is called a plane wave. A surface connecting points of radiation sends waves out radially in all directions.  A surface connecting points of equal phase for this situation is a sphere.  This wave is called a spherical wave. The meaning should be clear from the context. and B satisfying a wave equation.  This comes from the solution of Maxwell’s equations. Electromagnetic waves obey the superposition principle. E to B Ratio – Details, cont.  Its magnitude varies in time. at the same instant as E and B .
a unit surface area perpendicular to the direction of the wave propagation.  Therefore, the magnitude represents the power per unit area. The SI units of the Poynting vector are J/(s.m2) = W/m2.  This defines intensity in the same way as earlier. 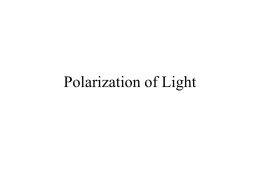  The optics industry calls power per unit area the irradiance.  Radiant intensity is defined as the power in watts per solid angle. When the average is taken, the time average of cos2(kx - ωt) = ½ is involved. The energy density, u, is the energy per unit volume. wave equals the instantaneous energy density associated with the electric field.  In a given volume, the energy is shared equally by the two fields. 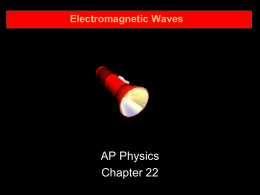 Electromagnetic waves transport momentum as well as energy. Δt, the total momentum is p = TER / c for complete absorption. But the magnitude of the Poynting vector is (dTER/dt)/A and so P = S / c.
For direct sunlight, the radiation pressure is about 5 x 10-6 N/m2 . Whenever a charged particle accelerates, it radiates energy. This is a half-wave antenna. a source of alternating voltage. The oscillator forces the charges to accelerate between the two rods. The antenna can be approximated by an oscillating electric dipole. perpendicular to the electric field lines at all points. The electric and magnetic fields are 90o out of phase at all times. This dipole energy dies out quickly as you move away from the antenna. magnetic field by a time-varying electric field. other and vary as 1/r. The result is the outward flow of energy at all times. 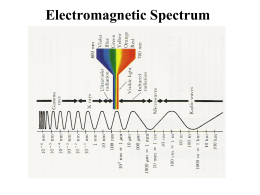 Various types of electromagnetic waves make up the em spectrum. There is no sharp division between one kind of em wave and the next. to violet (λ ~4 x 10-7 m). These are images of the Crab Nebula.